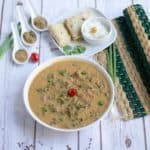 During Holi, I prepared this recipe for the Toka Box. (formerly known as IMC’s treasure box). Please check the new avatar of IMC’s Treasure Box. 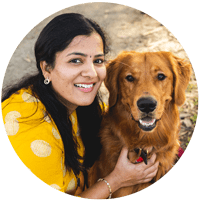 :-) The recipes that go as a part of Toka box are all kids friendly recipes, and also you can get them involved in cooking with these recipes. 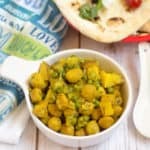 I kept the steps simple and used a microwave and conventional oven to prepare this recipe. So it’s a no-stove recipe. Also, I used the store bought milk powder to make the filling which makes it semi-home made recipes and it makes it easy for the kids to handle too. 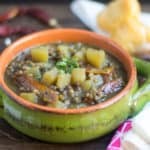 Initially, I was not planning to post this on my blog, but we loved this recipe so much so that I had to prepare it more than twice after holi. I was a bit skeptical if I can post this for the ABC bakes. I am glad I asked Valli. I completely forgot the rule that I cannot repeat the dishes from the same country more than twice. When I was asking her about this recipe, she reminded me the rules. I happily selected more than two recipes from the same country. I had to change my recipe list again, and now I have few more dishes to bake. I hope I can manage. I don’t think I can do a mega marathon without drama. :-) Anyways thanks to this Gujiya Recipe. PS: You can check the parental steps and child steps for this recipe here. I am going to share the generalized steps here below. Add the all-purpose flour, a pinch of salt and the ghee to a wide bowl. Mix the flour and ghee together. Ensure the ghee and flour are well combined. Add 1/2 cup of milk in the center. Mix the flour and form the dough. Knead it into a soft dough and cover it with a damp cloth and set aside. In a microwave safe bowl, add the milk powder, crushed pistachios/almonds, cardamom powder and condensed milk. Mix them all together and microwave it for 30 seconds. Remove it from microwave and mix the filling vigorously and microwave again for 30 seconds. Mix it again, and it should be crumbly like below. Now the filling is ready. 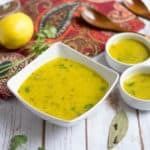 Remove the damp cloth from the dough and pinch small lemon sized balls. Roll the dough gently into soft, smooth balls. Using a rolling pin, roll the ball into a small round like roti. Spread the edges of the rolled dough with water using your fingertips. Take about 1 tbsp of the prepared mawa filling and place it in the center. Carefully bring the edges together and press the edges and form like a semi-circle. Make sure the edges are sealed properly. Using a fork, press the edges to create the striped pattern. Follow the same procedure and fill the remaining gujiyas too. Preheat the oven to 400 degrees F. Line a baking tray with parchment paper or aluminum foil. Place all the prepared Gujiyas in the baking dish brush the top of the gujiyas with ghee or oil using a pastry brush. Place the gujiya carefully in the oven and bake for 8 minutes. Glaze: Meanwhile the glaze can be prepared. In a small bowl add the 1 tbsp of milk and condensed milk and whisk them well. After 8 minutes, remove the gujiyas from the oven and flip them. Apply the condensed milk glaze using the pastry brush on the flipped side. Place the glazed gujiyas and bake again for 8 minutes at 400 deg F.
After 8 minutes remove the gujiyas carefully and flip them again. Reduce the oven temperature to 350 deg F.
Apply the condensed milk glaze using the pastry brush on the other side now. Place the glazed gujiyas and bake again for 4 minutes at 350 deg F.
So overall baking time is 20 minutes. 16 minutes(8 + 8) at 400 deg F and 4 minutes at 350 deg F. Let it cool and enjoy. Do not add any additional water while preparing the dough. Adjust the condensed milk quantity as per your sweet preferences. Also, add nuts/raisins of your choice. Instead of APF, you can use 1/2 cup of APF and 1/2 cup of wheat flour. 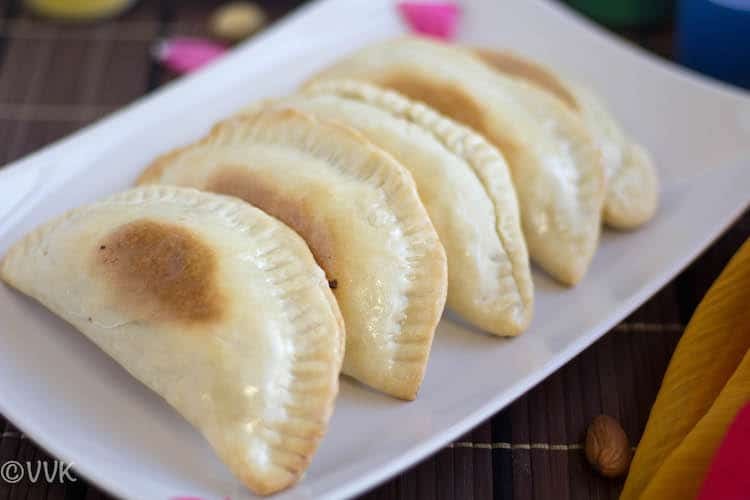 Festive special Baked Mawa Gujiya with condensed milk glaze. 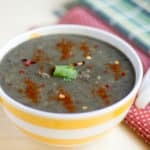 A no stove top recipe. Glaze: Meanwhile the glaze can be prepared. In a small bowl add the 1 tbsp of milk and condensed milk and whisk them well. After 8 minutes, remove the gujiyas from the oven and flip them. Baked gujiya with condensed milk glaze sounds interesting. OMG, baked gujiyas look delectable Vidhya. Love that condensed milk glaze — takes them over the top. Yummy!! Vidhya, the BM would not be fun without the dramas and this is the mega BM. Love the baked version of the gujjiya. Definitely makes it a little guilt free when I am sneaking in more than couple. Wow.. Baked Gujjiya.. A way better than the deep fried ones!! Should try your version soon!! he he lol… Thanks Veena. 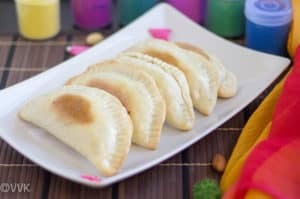 Wonderful looking baked gujiya. Love the ingredients and the glaze is particularly tempting. My very first thought when I saw the title was.. arent baked Gujjiyas going to be dry? And then when I read your post I was smiling, the glaze is a brilliant idea. I’m definitely going to try this!! Perfectly baked gujjiyas.. well done. he he.. Thanks Namratha. :-)Glad you liked it. 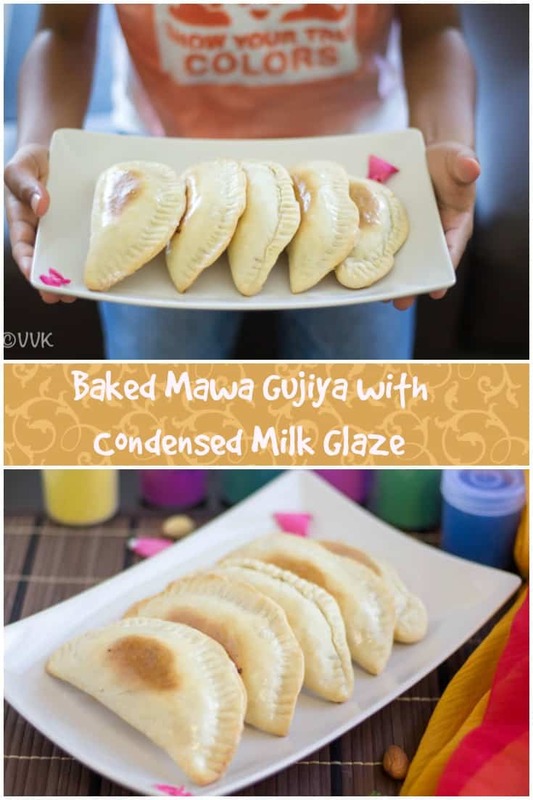 Wow baked gujiyas looks simply delicious and that glaze sounds absolutely brilliant vidhya, am so tempted to bake some gujiyas now. 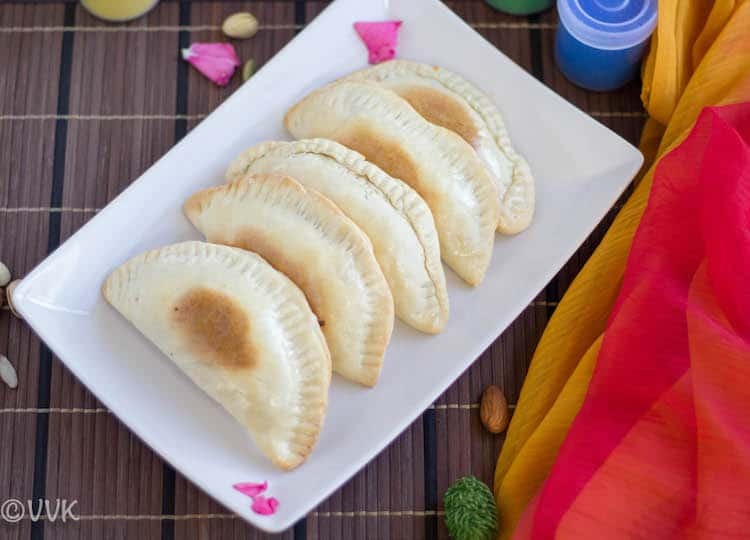 Beautifully baked dangerously addictive gujiyas. Oh wow..what a cool idea. The gujias look out of the world, the condensed milk glaze sounds so sinful.Beautifully done..